It must have been a sight to behold; a hand that appeared out of nowhere, writing an unknown message, “Mene, Mene, Tekel, Parsin.” The very sight of the hand writing on the wall caused King Belshazzar to be overcome with fright. What was the meaning of the message? That King Belshazzar had been “weighed in the balances and found wanting.” The days of his kingdom and been numbered, and on that very night, that which he treasured would be taken from him. One of the greatest judgment scenes in the Bible speaks to us today. 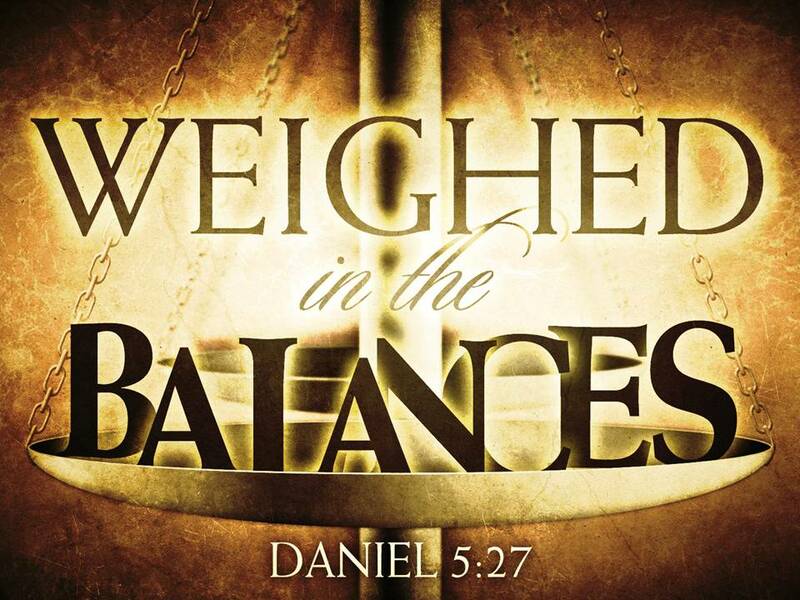 Just as Belshazzar was weighed in the balances, we too will be weighed in the eternal balances of God. Will the results be the same? Will we be found wanting? For our lesson today let’s consider the three charges that caused Belshazzar to be found wanting. As we examine his charges, take a long look at your life and ask yourself this question…”If I was to die today and weighed in the balances of God would I be found wanting?” If the answer is yes, then I would advise you to turn to Jesus and seek our His way so that you might have eternal life with Him. Let’s consider the three charges against Belshazzar. After Belshazzar had begun to drink wine he commanded that “the vessels of gold and silver that Nebuchadnezzar his father had taken out of the temple in Jerusalem be brought, that the king, his lords, his wives and his concubines might drink from them” (5:2). When Daniel is brought to decipher the hand writing on the wall he begins by reminding Belshazzar of how God blessed his father[i] Nebuchadnezzar and how when his heart was prideful, God humbled him (5:17-21). Daniel said, “And you his son, Belshazzar, have not humbled your heart, though you knew this, but you have lifted up yourself against the Lord of heaven. And the vessels of His house have been brought in before you, and you and your lords, your wives, and your concubines have drunk wine from them… but the God in whose hand is your breath, and whose are all your ways, you have not honored” (5:22-23). What is Belshazzar guilty of? Why was he found lacking when he was weighed in the balances? Because he exalted himself by dishonoring God and dishonoring God’s vessels. In the context of this feast it is likely that Belshazzar is dishonoring all the “gods” who had been subdued by the Babylonians. What about us? When we are weighed in the balances will be we found wanting? If we have not shown God honor by honoring His vessels, then yes we will be found wanting. That might sound strange at first. You might be asking yourself, “How can we dishonor God’s vessels like Belshazzar did?” We can dishonor God’s vessels in just the same way that Belshazzar did. When we dishonor God’s people, Christians, we dishonor God. For God’s people are God’s vessels in His holy temple. Note some of the passages that show this: Paul is called a “chosen vessel” of God to teach His name to the gentiles, to kings and the children of Israel (Acts 9:15 NKJV). In Paul’s discourse on the need for Christians to be approved by God, he said if a Christian will “cleanse himself from what is dishonorable, he will be a vessel for honorable use, set apart as holy, useful to the master of the house, ready for every good work” (2 Timothy 2:20-21). Peter instructs “husbands to live with their [wives] in an understanding way showing honor to the woman as the weaker vessel” (1 Peter 3:7). Therefore, if we dishonor God’s people (vessels), then we dishonor God. We dishonor God’s vessels by not: putting other people’s interest before our own (Philippians 2:1-11). When our actions are motivated by what’s best for us and not others, then we’re dishonoring God’s people, God’s vessels, and we’ll be found wanting. Furthermore, we dishonor God by not imparting grace with our words, actions and forgiveness (Ephesians 4:29-32). Paul says this kind of conduct, “grieves the Holy Spirit” (4:30). Finally, we dishonor God by dishonoring His people when we as husbands don’t treat our wives in an understanding way (1 Peter 3:7). He doesn’t say that we have to understand them, we rarely will, but that we treat them in an understanding way, in a delicate way that gives them honor. If you were to stand before God today and your life was weighed in the balances, would you be wanting because you have dishonored God by dishonoring His vessels, His people? If so friend, then show God honor by humbling yourself and honoring His people. After Belshazzar had dishonored God by dishonoring God’s vessels, Belshazzar and all the people at his banquet “drank wine and praised the gods of gold and silver, bronze, iron, wood and stone.” (5:4). As part of his rebuke of Belshazzar, Daniel said, “And you have praised the gods of silver and gold, of bronze, iron, wood, stone, which do not see or hear or know but the God in whose hand is your breath, and whose are all your ways, you have not honored” (5:23b-24). What was Belshazzar guilty of? He was guilty of honoring other gods above Jehovah God. He gave honor and praise to those things which had no saving power. They could not see, or hear, or know the plight of Belshazzar because they were empty. Belshazzar dishonored the One who had saving power, the One who sustained his life, and controlled his steps. What about us? When we are weighed in the balances will be we found wanting? If we have honored and praised other gods over Jehovah God, then we will be. Again, that might sound strange to us because we don’t worship idols. We don’t worship false gods. Or do we? Friends please understand, we may not worship graven images but we certainly have idols and empty gods in our lives that we are prone to worship. Consider the following two examples. Paul says anything we covet is our idol. In Colossians 3:5 Paul said, “Put to death therefore what is earthly in you: sexual immorality, impurity, passion, evil desire, and covetousness, which is idolatry.” Paul is saying that which we yearn for, the object of our covetousness becomes our idol. Let that sink in for a minute. When we have a deep yearning to possess someone or something, it permeates our minds. It’s our idol because God wants to permeate our minds. The object that we covet becomes our goal and focus. It’s our idol because God wants to be our focus and goal. When we simply can’t be happy without it, then it becomes our idol, because God wants to be the sole source of our happiness. What kind of items do we covet and consequently erect as our idols? Cars, houses, clothing, people, jobs, TV’s, phones and the list can go on and on. When any of these things become our focus, then we have erected it as our idol and God will call us into judgment for it. Maybe those things aren’t your kind of idol, maybe it’s something else. Another god that we are tempted to worship is the god of self. Paul said it this way “For many, of whom I have often told you and now tell you even with tears, walk as enemies of the cross of Christ. Their end is destruction, their god is their belly, and they glory in their shame, with minds set on earthly things” (Philippians 3:17-18). Who are those that set themselves up as their own god? Those who set their minds on earthly things (Philippians 3:18), who serve their own appetites rather than serve God (cf. Romans 16:18) and those who are “lovers of pleasure rather than lovers of God” (2 Timothy 3:4). If you were to stand before God today and your life was weighed in the balances, would you be wanting because you honored other gods and not Jehovah God? If so friends, put away the idols from your lives and turn to the one true God and worship Him and Him alone. After Daniel’s lengthy rebuke of Belshazzar, Daniel interprets the writing on the wall saying, “This is the interpretation of the matter: MENE, God has numbered the days of your kingdom and brought it to an end; TEKEL, you have been weighted in the balances and found wanting; PERES, your kingdom is divided and given to the Medes and Persians” (Daniel 5:26-28). There was but a matter of hours between Daniel’s interpretation of the writing and the fulfillment of its word. The account ends by saying, “That very night Belshazzar the Chaldean king was killed. And Darius the Mede received the kingdom, being about sixty-two years old” (Daniel 5:30-31). What was Belshazzar guilty of? He was guilty of feasting when he should have been watching. The armies of Darius didn’t magically appear that night. In fact, the very night the hand wrote on the wall, Darius’ armies had been outside the city for many days. So why would they be feasting when an opposing army was outside their walls? I think the context of the passage reveals for us the mindset of Belshazzar and his people. They were full of pride. At that time, Babylon had the most massive walls in the entire ancient world. They felt their city was impenetrable, and in fact, it was except for one area, the water gates on the Euphrates River. So instead of being humbly watchful, Belshazzar was pridefully feasting. What about us? When we are weighed in the balances will be we found wanting? Will we be found feasting or watching? For instance, will we be feasting or watching when the armies of Satan encamp against us to tempt us? Jesus said to Peter (this is after he had boasted that he would die with Jesus), “Watch and pray that you may not enter into temptation. The spirit indeed is willing, but the flesh is weak” (Matthew 26:41). You know the rest of the story. Peter didn’t watch, he feasted of sorts, and he was overcome by temptation and three times denied he knew the Savior (Matthew 26:69-75). Years later, a more seasoned Peter would write, “Be sober-minded; be watchful. Your adversary the devil prowls around like a roaring lion, seeking someone to devour” (1 Peter 5:8). What’s Peter saying? Don’t feast when the enemy is at hand, instead be watchful, guard you soul. Time and time again, Jesus warned His disciples and He warns us, judgment is coming at an hour you do not expect, “therefore, stay awake… be ready… and watch, for you know neither the day nor the hour” (Matthew 24:42, 44, 25:13). What’s Jesus saying? Don’t be consumed with feasting; instead be watching, be ready, for the heavenly armies will come at an hour you do not expect and judgment will begin with you. If you were to stand before God today and your life was weighed in the balances, would you be wanting because you’ve been feasting when you should have been watching? If so friends, you can redeem the time today and prayerfully watch, and hasten the day of the Lord’s return by ceasing from your feasting and begin to watch for Him. The king’s reaction to see the handwriting on the wall is quite telling. Daniel 5:5b-6 says, “And the king saw the hand as it wrote. Then the King’s color changed, and his thoughts alarmed him; his limbs gave way, and his knees knocked together.” This is the description of a guilty man; a man who knows that his days are numbered. The text says that when Jesus returns “every knee shall bow” at the sight of His glory (cf. Romans 14:11; Philippians 2:10). Let me ask you, why will you bow at the return of Jesus? Will it be out of your joy at the sight of you King, or will it be out of fear with your limbs giving way, and your knees knocking together? You know the answer. If you know that you would bow out of fear then friend I urge you to get right with God today, before it’s too late. [i] Nebuchadnezzar was not literally the father of Belshazzar (5:2); Belshazzar was the son of Nabonidus, with whom he shared co-regency during the closing years of the Babylonian monarchy. The word “father” in Aramaic, like Hebrew, can mean “ancestor” or “predecessor.” Belshazzar wanted to emphasize his direct connection to this important ruler who had taken Babylon to its peak. From ESVSB p. 1595.